I've mentioned that I'm a cyclist, yes? (Short pause for you to roll your eyes at me.) Well. I'm actually a lazy cyclist. 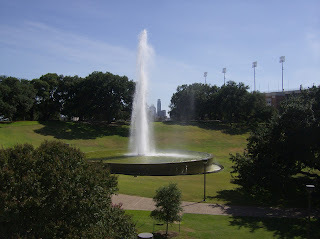 You see, my apartment is at a lower elevation that the University of Texas. Which means, when I go to school every morning, those rolling hills that I ride on are more up than down. And the first of them is the worst: No matter which way I go from my house (and I've tried every possible direction), I have to go up a massive, steep hill at about a mile into the ride. So, a lot of days, I take the bike to a bus stop, let Capital Metro take me over those quad-smashing verticals, and get off near the university. Here's the real problem: The only way to make the hills not hard is to do it every day. After a day or two of taking the bus, the hills are that much harder to deal with. not) or Gloomyfield (when it's cloudy). So, while reflecting on this the other day, I caught myself longing for the relative flat of my homeland, and in the middle of my imaginings, I thought, "I wish I had ridden my bike to school when I was in high school." Reality check: 1. My parents would never have allowed such a thing. I'm sure my father is still losing sleep over me being a commuter cyclist, even though I've been one for years. 2. It's freezing in Indiana. I maybe would have had three months of the school year (August, September, May) of riding, and then only if the Snow Miser had pity on me and backed off a bit. 3. 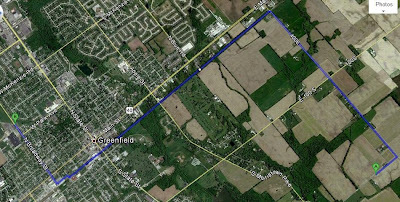 My hometown is conducive to cycling in many ways, but the county roads I would have had to ride on for at least half of my journey are not. They're narrow and drivers zoom along them much too fast. Here's where the details stop being minor and start being kind of important. You see, this route follows the Pennsy Trail, which is indeed the best possible way for getting across town (the line parallel to Main Street). 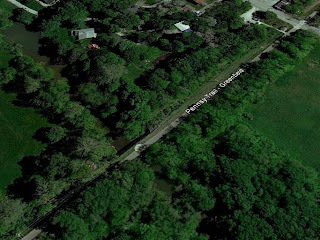 Unfortunately, the trail wasn't built until after I moved away; it's a Rails-to-Trails project (Pennsylvania Railroad -> Pennsy Trail), but when I was in high school it was just weeds-where-rails-used-to-be. 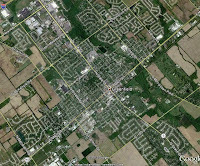 been there when I lived in Indiana! So, it's nice to think about what it would have been like to be a commuter cyclist in high school, but it really would have been impossible, even if I had had this bright plan 20 years ago. I'll have to content myself with living in the here and now, which happens to be Austin in 2012, a place with plenty of trails, bike lanes, and steep hills to challenge myself with. No time travel required, but it may be time to lose the lazy. What's something that makes you wonder, "Why didn't I ever _____?" Would it really have been feasible, or is it just happy imaginings for you? Today is supposed to be my book blogging day. Unfortunately, all I've been reading lately is school stuff, none of which merits a blog post. So, I'm blogging about blogging instead. Today is the first Sunday of Lent. What does that mean? I'm not sure. set of prayer candles. Source. You see, I'm a Protestant. I'm what you might call a 'cafeteria Protestant', since I pick and choose my practises from the buffet line of Christianity. (I wish I could claim that phrase as my own, but alas, I learned it from the internets many years ago.) Lent is something that I first put on my plate about 20 years ago, and every year I keep coming back round for another helping. However, I've always attended the sort of Protestant church that keeps no high church traditions, so I've been doing this on my own for a long time (although in the past few years, I've been a contact point for some of my Protestant friends who have ventured over for a peek at the Catholic menu and said, "I'll have some of that, too."). But, not this year. I asked some of our friends at our new church (which is called Red River Church, by the way; I don't know if I've linked to it before) a couple of months ago if we do Lent at church, and they said, "Kinda. We don't really do it ourselves, though." (They weren't really speaking in unison, for all that they are newlyweds.) So I've no idea what to expect today. We might have a regular service, which would be just fine. 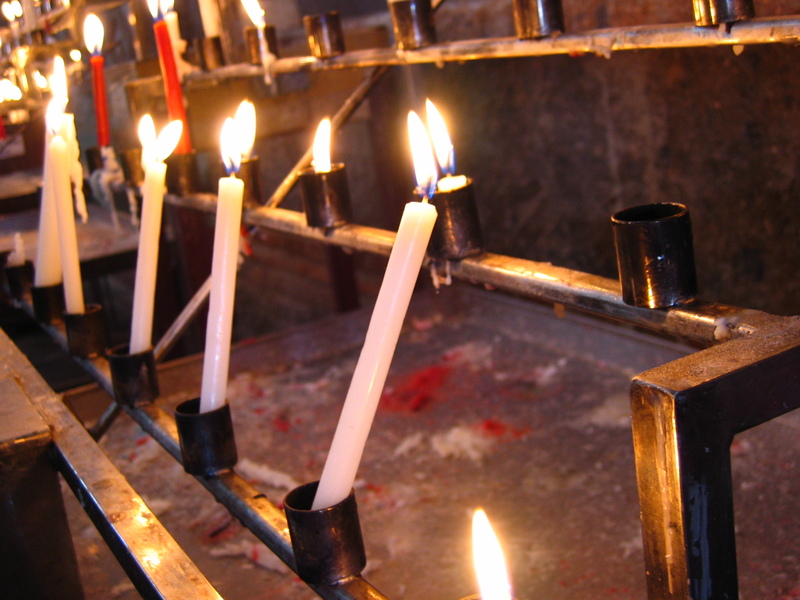 We might do something different because it's Lent, which would be new and exciting for me. We might have a regular service with a reminder that it's the first Sunday of Lent, which would also be cool. Whatever it is, I'm paying attention. I do my best, as I hope that all Christians do, to be attentive to what the Lord might be trying to teach me at all seasons, but there's something different about this season. I'm more intentional in my walk. I'm more aware of my own stumbles and missteps. It's during this time, year after year, that I realise just how many times a day I think about dumb stuff that doesn't matter. For example, the year I gave up TV for Lent, I thought I wasn't making that big of a sacrifice. I don't watch that much TV, anyway; surely I was being too easy on myself! Ha. That's the year I found out just how easily distracted I am, and just how many times a day I think about TV. It never fails, no matter what my chosen 'sacrifice' is. I think that time could be better spent. That energy could be used in so many other directions. And that's what makes me especially grateful for Lent. Do you practise Lent? Are you doing something special today? Quite some time ago, BlogHer had an offer for free samples of Bounce Dryer Bars, with a review of the product appreciated, but not required. I got excited and registered, thinking I would wait until the first one ran out before reviewing it, since there was no timetable attached. First, some background: I normally use dryer sheets, and since a whole sheet tends to come out with some of the stiffness/fragrance still in it, I generally cut them in half. I do about two loads of laundry a week, so a box of 100 Snuggle sheets would normally last me about 100 weeks, or-- to be very much to the point-- two years. 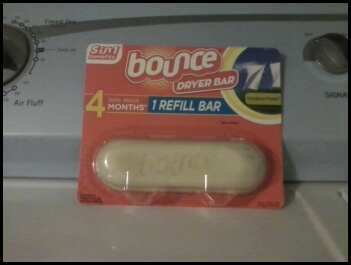 Bounce Dryer Bars come in 2-, 3-, 4-, and 6-month sizes. I received a 4-month size for the promotion, and while I can't pin down the exact time I got the bar, I'm almost certain it was more than four months ago. It lived up to its expected life span. Installation: Was very easy. I followed the directions, and have had no problems. Use: Required no additional effort from me, apart from explaining to our guests that they didn't need to use dryer sheets. I've been entirely satisfied with the fabric softening and the nice scent. 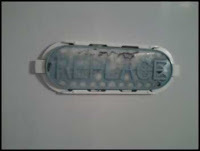 Environmental factors: The holder attached to the inside of the dryer is reusable, and Bounce sells refill bars, so I need not buy an entire new set every time. or two out of it. Removal: Was a bit tricky. I followed the directions again, but I think the bar had melted a bit to the holder, so it took a bit of pressing for it to come off. In the course of pressing on it, I managed to move the entire dryer. The old bar was serious about staying in the holder. However, it came out in the end. 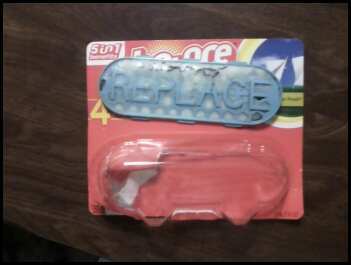 Environmental factors: It comes with a lot of non-recyclable packing. The refill that I bought has a lot less packing than the starter package did, but it still had to go in the rubbish, as did the old bar. Price: I can't find my receipt, so I did a quick shopping search on Google. Bounce bars are $7 for a 4-month refill bar online (I'm sure it was a couple of dollars cheaper in Target), while a box of 80 Snuggle sheets is $4. One quick calculation later and I get $.05 per week for the Snuggle sheets, as compared to $.38 per week for the Bounce bars. So, back to the environment thing for a second (this is green Friday, after all!). If I saved all the dryer sheets I normally use over four months, they would probably add up to at least as much rubbish as the bars produce, if not more. 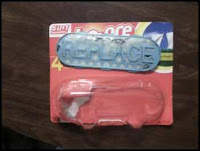 (Although I do get a reuse out of my dryer sheets; I use them as dust rags on non-wooden surfaces before tossing them.) A bottle of liquid softener definitely comes out ahead in the rubbish department, since the package it comes in is recyclable. Plus, some brands have smaller refill cartons, so you don't have to toss the bottle after each use. However, the cheapest Snuggle liquid I can find online is $4 for 26 loads, which is about three months in this house. It's a slightly better deal than the Bounce bar, but more work. Your mileage may vary. Now, if you're really into cutting back on packaging and chemical use in your home, The Damsel in Dis Dress has a very nice post about how to make your own liquid softener, with a link to a post on how to make dryer sheets. I may try one of those next, but it will be awhile, because a have a 4-month Bounce bar and 1/2 of a 200-sheet box of Snuggle sheets to get through first. Have you tried dryer bars? Do you like them? Or do you have another fabric-softening secret to share? I have a problem, writers: I have a writing club, but no good way for us all to give and receive feedback. 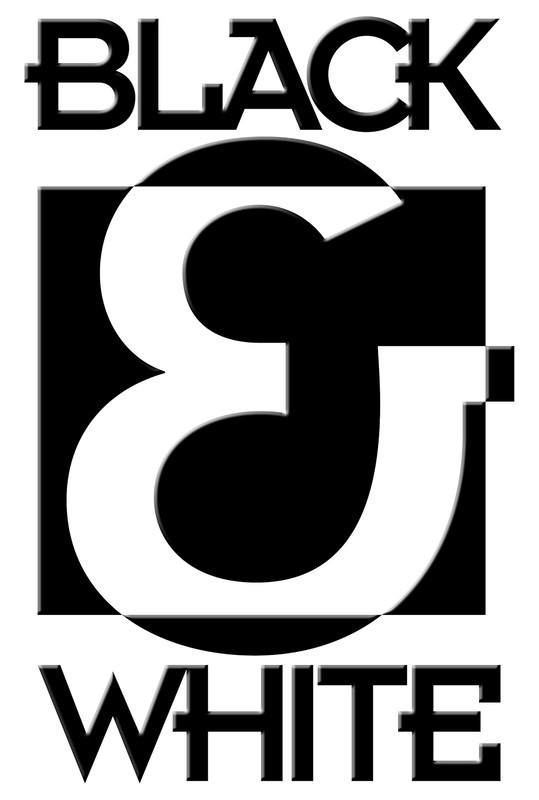 Our logo. Isn't it fun? I vaguely knew this was an issue, but it really became obvious a couple of days ago when someone asked me to read a story and tell him what I thought. I had one of those 'duh' moments when I thought, "I bet other people would also like feedback. We're a writing club, after all!" However... I've no idea where to go for that. Does anyone have any suggestions for a secure place where just members of our club could upload stuff for feedback? Can you create closed groups on any of the writing sites? I'm poking around, but I know that my writing readers are very much on the spot and might know of things that I wouldn't think of. Oh, and our club has no budget. If a site is going to cost more than a couple of bucks, we can't use it. Hi there mates! Simply want to request for your advise. I will be seriously busy along with work having a occupation and attending tennis lessons. I want to rely on someone else to try and do my homework for me in order to grab the load off my shoulders. Is it considered cheating? Would I get in trouble with the instructors? Exactly what do you advise me personally to do? 1. Buy a dictionary. 2. Start practicing time management. 3. Don't cheat unless you're willing for your college career to end badly. 4. Use fewer adverbs. Okay, I speak fluent English and read basic French, and I have to say this reads like no Canadian dialect that I've ever heard. My best guess is that we're to buy Canucks jerseys to help single mothers speak Chinese? I think this one may be coming from the same spambots that have been infesting Twitter this week (based on the urls that I deleted). Seriously, for your own sanity, don't try to Google translate this one. I'm sure it's not pretty. So, there you have it! Any interesting spam in your neighbourhood lately? If you'll excuse me, I'm off to buy a Canucks jersey, since it seems to be so important. to read, I wouldn't mind. ... and denounce Captchas. As if the old word verifications weren't bad enough, now we have to type in two words? And only one of them is a real word? And the second one has that *clever* colour-changing blur halfway through? No. I'm done. I'm aware that some people have a spam problem, but I'm also aware that the spam filter on Blogger works great. (So great, in fact, that I have another spam-filter-inspired post coming.) And I'm definitely aware of chatter on the blogosphere that word verifications make you look either 1. paranoid or 2. like a noob. So, to spare my own sanity, from here on out captchas get one attempt. And if I can't get it right the first time, I will go on my way having done my best. Do you use captchas? Do you think they're necessary? Or are they driving you crazy, too? Yesterday, when I was writing about the Mission ride, I was referring back to my tweets from the day of the event to refresh my memory. One of my coworkers asked, "So you were tweeting to your future self?" Yes. Yes, I was. Thanks, Past Su. Present Su appreciates your foresight. 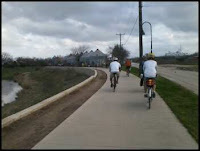 Sadly, this is the last of my posts about the Texas Trails and Active Transportation Conference. 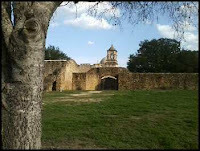 On the off chance that you've managed to avoid the previous four posts: San Antonio B-Cycle; Bogata, Seville, and Dallas; Texas Senator Rodney Ellis; Mission Trail Ride in San Antonio. Today: Former U.S. Representative Jim Oberstar. Martinez at the end of the Mission Trail ride. Rep. Oberstar was the keynote speaker at dinner (which was delicious, BTW). Earlier in the day, he had been on the bike ride (the ride was called "Riding with the Stars". He was one of the stars. It took me the entire day to figure this out) and I happened to be near him when we stopped for a second. I immediately whipped out my phone to send a tweet and chatted with him a bit before another man walked up and said something like, "It's an honour to meet you, Congressman. Can I get a picture with you?" I then became the designated picture-taker for a couple of minutes until we shoved off again, all the while thinking, "Congressman? Did that guy say Congressman?" Yes, he did. I don't think one needs to speak differently to civil servants, but I wish I'd said something more intelligent than, "I'm posting this on Twitter." Anyway. So Rep. Oberstar took the mic and began with a nice history lesson: "Forty-three years ago, a man stepped on the moon, but he couldn't have biked to work safely." (My personal aside: The astronauts living in Houston still can't.) 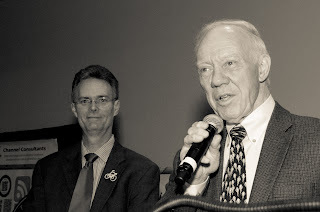 Twenty years ago, Rep. Oberstar was pushing for grassroots activism for cycling. From 1971 to 1991, the U.S. invested $40 million in cycling; since '91, it's been more like $3 billion. I can't tell you how much I appreciate that, as a daily user of some of the bike lanes and other cycling-friendly improvements that came from Austin investing in cycling. The result in Oberstar's home state (Minnesota) is pretty impressive: Minneapolis is one of the top cities in the U.S. for cycling. Rep. Oberstar said that cycling should be "inclusive and bipartisan." He shared some statistics with us: In 2010, more bikes were sold in the U.S. than cars (bicycling is an important sector of our economy), and the average car trip in the U.S. is shorter than three miles. So, if people have a safe place to ride, many of those trips could be done by bicycle instead of by car. And finally, Rep. Oberstar asked that cycling users and advocates stand up to let Congress and the President know that we expect them so support cycling. No arguments from me! After he finished, Rep. Oberstar got a nice ovation from the crowd. But we weren't done yet, because BikeTexas had an award for Bike Friendly Oak Cliff, and Rep. Oberstar congratulated them on receiving it. In French. It was brilliant. 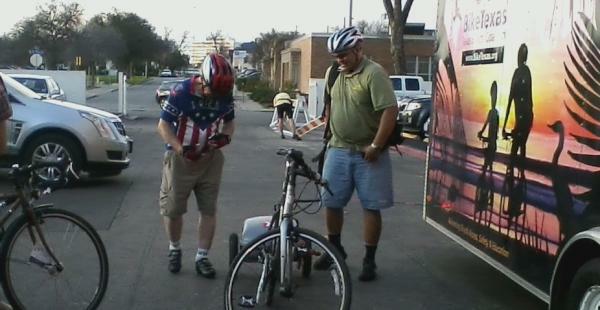 And that brings me to the end of my coverage of the Texas Trails and Active Transportation Conference. (Kinda... I've asked someone to do a guest post about a Friday session, which I hope to have up next week.) I hope it was moderately enjoyable. Tomorrow, your regularly scheduled silliness shall return! Yep, still covering the Texas Trails and Active Transportation conference. 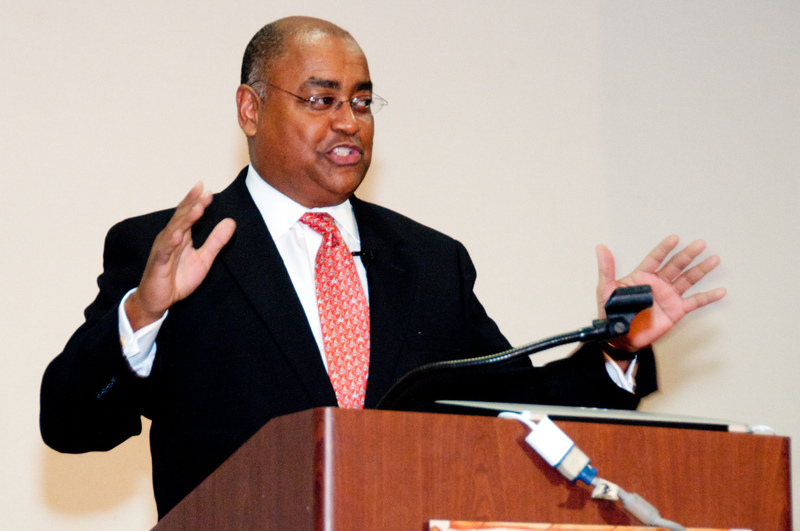 Previous posts: San Antonio B-Cycle, Bogata and Seville, and Texas Senator Rodney Ellis. I missed the afternoon sessions at the conference in favour of a mobile workshop on the Mission Trail. Truth be told, I should have been working during this time, but I pulled all my best rhetoric out to pathetically beg to be allowed to go on the ride. My major point was that I've lived in Texas for 12 years without ever seeing the Alamo, in the hopes that all the Texans around me would jump at the chance to educate the northerner. What happened in real life is that my coworker who I was supposed to be helping in the afternoon sent me on my way on the grounds that we weren't that busy. It's possible she was acting out of self-preservation, but I really wasn't planning to whine if I didn't get my own way. But hey, whatever it takes. So, I dashed out, got a helmet, got a bike, borrowed (okay, took: she didn't want it back) a ponytail holder from Mellow Eileen, and then stood around while everyone else got themselves sorted out. It's possible that I smiled and helped hand out helmets, but I was so excited to be seeing the missions! And taking part in a group ride! With BikeTexas! That I was more exuberant than helpful. Yes, inside I'm still about eight years old. We finally set out (yep, eight!) 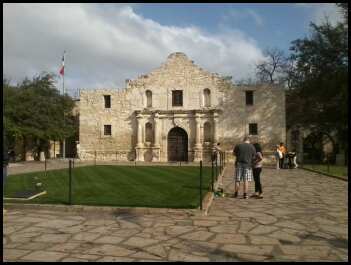 and headed to the Alamo first. Now, I've heard that one's first visit to the Alamo is always a bit anticlimactic, because you expect it to be a big huge building with historical markers and open fields or whatever, but reality is that it's an old building in the middle of downtown San Antonio, with tons of larger buildings all around it. We stopped, we took a group photo (many thanks to the woman who was innocently standing around before we rolled up and pressed her into service to operate our cameras), and then we rolled off again towards the Riverwalk. A guy who was riding not too far from me had some running commentary going on the historical buildings that we were passing-- presumably, he's from San Antonio and is up on the tour guide bit. Or he was just really good at making things up. Either way, we were riding past some really pretty buildings that apparently have been there for a while. Mission San Jose. It's absolutely gorgeous, and the park around it is huge. Basically, San Jose is what I've always thought the Alamo looked like. It was at this point in my day that I realised that I had turned into one of those people that goes to amazing, beautiful, and/or historical places and can't tear their eyes from their phone. In fact, I was caught on camera doing it, because a local TV station was interviewing a former Congressman about cycling stuff when I emerged from the church behind him in the act of tweeting. I was only doing it because I was supposed to be working! Honest! After doing some chatting, networking, and generally having a good time at Mission San Jose, we headed back to the hotel for the final session of the evening. Which, if all goes according to plan, I will tell you about tomorrow. I wrote this book review of Writing with Style: Conversations on the Art of Writing for one of my classes. And since I wrote the review from the perspective of a fiction writer, I got permission from my instructor to post it online. So, here you are! Enjoy! Even if you keep to the vaunted must-reads, like Stephen King’s On Writing or Robert McKee’s Story or Anne Lamott’s Bird by Bird, writing about writing is a crowded space. It would be easy to ignore John R. Trimble’s Writing with Style: Conversations on the Art of Writing just on the basis of his intended audience: Trimble is writing to nonfiction, expository writers, not novelists. A casual internet search will show that his writing guide is popular, but does it have anything for the fiction writer? Yes and no. If you’re a fiction writer who never intends to write any nonfiction—no blog posts, book reviews, or letters to the editor—then you can probably skip Trimble’s book. If your writing is swimming along just fine but you aren’t yet ready to revise, then wait to pick this one up. If you’ve read everything in the writing section at your local bookstore (twice), you’ve attended every author event in a 100-mile radius, and you have a shelf of notebooks filled with all you’ve learned, then for goodness’ sake, stop reading and start writing. For the rest of us, Trimble can’t hurt. He knows fiction writers well enough to use our best pick-up lines: being smart about adverbs (70), choosing sensible dialogue tags (155), breaking the “rules” of English (76-87), and of course, Mark Twain’s bit about the right word and the lightning bug (53). That he managed to hold off bringing the Twain until the sixth chapter shows admirable restraint. Trimble even mentions creative writers, although he has us shunted into a footnote: “Poetry, fiction, plays—that’s all termed ‘creative writing,’ even though it’s sometimes far less creative than good expository writing” (29). Fire up your laptops, ladies and gents; he’s baiting us. I can imagine fiction writers everywhere shouting, “Put this creative writing on your expository needles and knit it!” But is that a bad thing? Not at all. The writer who was frustrated enough in the first place to pick up a book not designed for creative writers might profit from some backhanded motivation. Or maybe it’s time to set your tired manuscript aside and write some nonfiction, just to see if he’s right about the creative side of exposition. The chapter that fiction writers will want to spend some time and a highlighter with, however, is the one on readability. “A readable style is one that invites reading” (58), he says. Ah, now Trimble is speaking our language. He sums up the elusive “voice” we all labor to develop when he writes, “If a person accepts herself, she will be herself, and will speak her mind in her own idiom without inhibition” (60). He also doesn’t try to hide the sweaty reality of good writing: “Considerable labor has been lavished on these sentences, we can be sure, not a little of it on concealing that very labor” (63). If you are looking for something on how to become a writer in five easy steps, then this is the book for you, if only to disabuse you of the “easy”. Is Trimble’s book earthshaking? No. Is it useful? Somewhat. 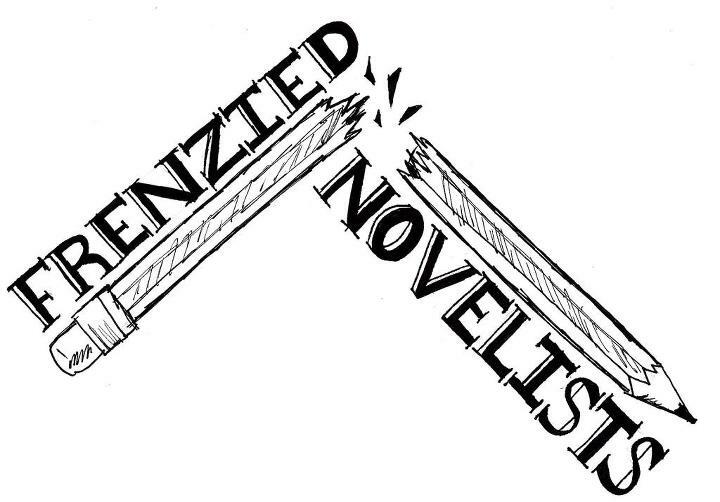 He assures us that “Writing is hard” does not equal “I’m a bad writer,” something all writers could stand to remember. Plus, looking at our craft through another genre’s eyes might lend some new perspective. That’s never a bad thing. But give Mark Twain a rest. 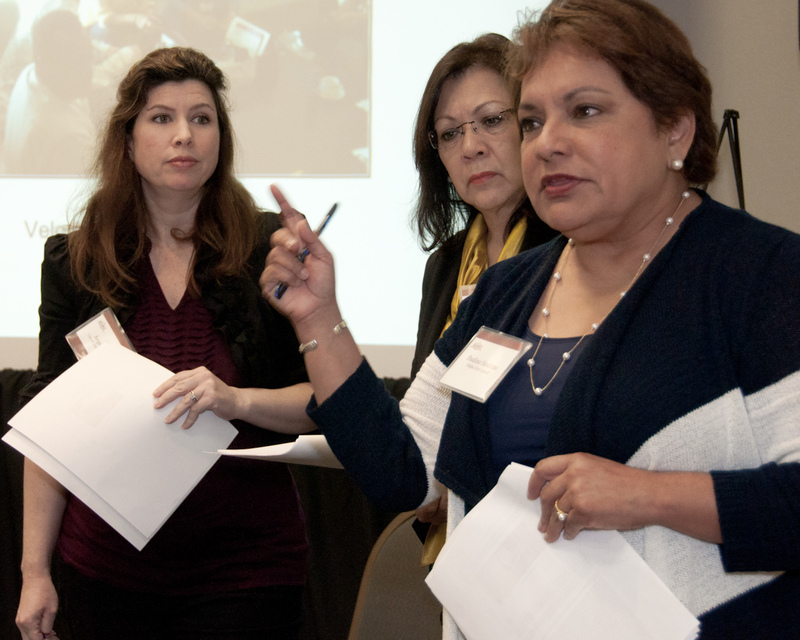 Yes, I'm still posting about the Texas Trails and Active Transportation Conference. It was a very good day. I remember that the food for lunch was very good. I do not remember what it was, except that we had chocolate cake for dessert. And I could have eaten just chocolate cake and been perfectly happy. Senator Ellis leads a lot of bike rides during legislative sessions, in his district, and this past year, as the national conference of state legislators. He said, "I make it my business to get as many of my colleagues as possible out on a bike ride." He talked about the benefits of cycling, not the least of which is that everyone relaxes and for a few minutes it's not about red vs. blue, but instead is about having fun and seeing things at a slower pace than the usual breakneck legislative crazy. Plus, once lawmakers have been on a bike a few times, they are a lot more open to the idea of making sure streets are safe for people to continue cycling. He also talked about how city bike rides are great for showcasing the city and getting people to be more active. 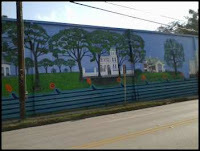 This came on the heels of sharing the success of Tour da Hood, a bike ride that the Senator leads in Houston through less-than-wonderful neighbourhoods, which "generated excitement". He mentioned the problem with getting a statewide Safe Passing Law passed in the '09 legislative session (it passed through the state legislature with bipartisan support, but then the governor who I will under no circumstances mention by name on my blog vetoed it). Despite that disappointment, Senator Ellis said he was proud that several cities in Texas have their own Safe Passing ordinances (including Austin and San Antonio). It was great to hear from Senator Ellis. And that takes care of part three of my conference posts. I bet you're glad that I don't recap all of my days in this kind of detail, eh? ...than the ones the news keeps talking about. Yes! I'm posting twice in one day. Because I keep forgetting to sign up for Rachel Harrie's Writers' Campaign, and before I can sign up, I must blog about it. 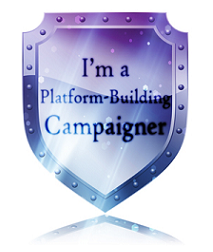 Kind of like sending up a blogging Bat Signal to all the other campaigners. Here I am! The Campaign is for all writers: published, aspiring, or somewhere in between. We offer encouragement, support, and ideas, and some of us from previous campaigns have remained blogging friends and still read one another's blogs and follow one another on Twitter, long after the original Crusade (former name) was over. Yep, we seem to like each other a bit. Wanna get in on the action? Great! Pop on over to Rachel's blog to read more and sign up. But hurry, because she closes the list on Wednesday and you'll be stuck waiting until Campaign #5! I was on campus Friday (okay, I'm on campus every day), and I passed some people holding a sign that read, "You Deserve Hell." Oh, good grief. I passed them twice, because I went from my work to an event and back to work again. When I came back, the man had a small crowd of students around him. Now, this blog is G-rated, because I don't want any of my friends' kids seeing anything untoward on my blog, so I'll put this as delicately as possible: The man inquired into a student's reproductive life, and upon hearing his answer, suggested that since he's already going to hell, the student should indulge in the actual deed instead of the poor substitute he's been contenting himself with. How's that for delicate? Gosh, I love euphemisms. 1. I'm also a Christ follower, and unlike those people, I'm on campus every day interacting with students. I don't come in once for a stunt and leave. I wear Christian t-shirts and it's no secret that I go to church. I would really hate for someone to walk past those people, then see me with a Bible bowl t-shirt, and refuse to talk to me because of association. I'm not the same as them. 2. That's terrible, terrible advice. The loss of morals is hardly the only danger involved in doing the deed. 3. Scaring people into following Jesus is so 1700. I don't for one second believe that my Christianity will just rub off on those around me because of the t-shirts I wear. But here's what I know: Because I tweet about being at church or Facebook about going to prayer group, because I don't swear every third word, because I wear my t-shirts along with a smile and a desire to get along with my classmates... because of those things, sometimes people come talk to me when they need help. Sometimes I get a Facebook message from someone I haven't seen in years asking me to pray for them. Sometimes I'm asked if my church is a judgement-free place. (It is.) And sometimes, I'm a point of safety for 20-year-olds who aren't as advanced in their faith as I am and who have to cope daily with the onslaught of atheism and agnosticism that is as characteristic of our campus as it is of any other state university. I love being the person who can reassure my friends that they aren't alone in loving Jesus. So, the One Simple Step? Don't. Don't be a jerk. Don't be so aggressive in your faith-sharing that you drive people away. Do a favour to other believers around you, and don't be a poor representation of what it means to love Jesus. Just don't. So, I know that my readers aren't jerks. What do you think? If you're a believer, how do you love your neighbour? What's your favourite thing about your church (or whatever you call your gathering of believers)? And if you aren't a believer: I'm trying really hard not to be a jerk. I hope everyone around you is doing the same. 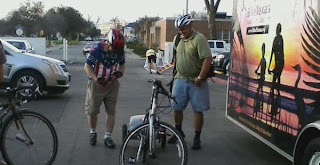 Previously on Cheekyness: I went to the Texas Trails and Active Transportation Conference, and afterwards I wrote about B-Cycle in San Antonio. We continue our saga with the second session I attended: Lessons from Bogotá and Seville - A City Council Perspective. Three Dallas City Council members went out of the country last year to have a look at how cycling is done in other places, and they came back with changed perspectives and enthusiasm to try some things in Dallas. In Bogatá, Ciclovía started with two blocks of city streets being blocked off for families to enjoy. Now, 75 miles of streets around Bogatá are closed every Sunday, and over one million people participate weekly. Very cool. Here in the U.S., cities are starting to catch on and have their own events from time to time. It's coming to Austin in May-- yay!-- and I'll be blogging about that later on once their publicity gets going. The coolest thing (IMO) from Seville was their smart signage. Suppose you're on your way to work during rush hour-- along your route, you'd see signs in real time telling you how long it is projected to take from your position to get to major landmarks via different types of transportation. For instance, it might say, "DOWNTOWN: By Car, 15 minutes; By Bike, 8 minutes; Walking, 10 minutes." Happily, since Dallas has made such wide streets, they have plenty of space to go around striping bike lanes. And the sooner, the better, IMO. 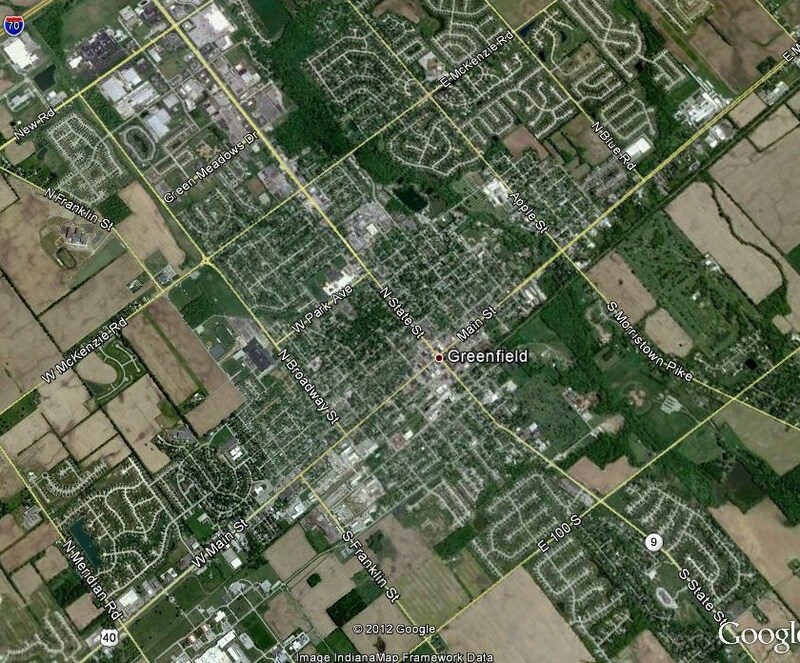 Some day I may actually visit there, and I'd like to ride my bike in relative safety. 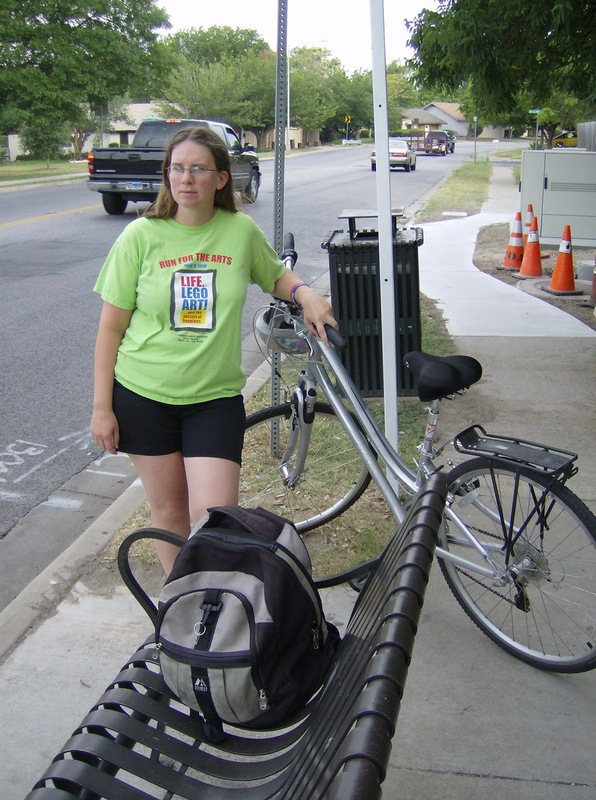 While on the subject of Dallas-- later on in the day, BikeTexas gave an award to Bike Friendly Oak Cliff for their work to promote cycling in their section of Dallas. It would be absolutely, crazy-awesome fantastic if Dallas could take off to become a leader in cycling-- not only would that be good for Texas, but it would be great for the entire South, since most bicycle-friendly cities in the U.S. are in the North. The sooner a southern city steps up to show us it can be done, the happier and safer we all shall be. Do I have any readers from Dallas? Do you ride your bike? Everyone else: Did you see that Dallas is returning to cable TV this summer? It's the day you've all been waiting for: the glorious return of Have Bus, Will Travel! Yes, I know that no one has been waiting that much. However, today's little adventure is all about route #37, which it the bus that comes by my apartment. You know the saying "Familiarity breeds contempt," yes? It does. A lot of contempt. This route is long and has a lot of stops. A trip from my apartment to UT, in theory, takes 35 minutes. In practise, it's more like 45-60 during rush hour, because we stop at every stop. If I stay on and go all the way downtown, it's a 45 minute trip that can stretch to over an hour. And it's usually packed, hot, and noisy. The worst trip all day is the one right after school gets out, because there are four schools on the route and so the (generally) already-full bus has to take on massive groups of kids. I will say that the kids are always well behaved (better behaved than most of the adults, anyway), but they have us seriously outnumbered. And any small ones, like kindergarten or first graders, have to have a seat, which is hard to manage. And kind of a dumb rule, IMO: When it's that packed, how could they possibly fall down? To their credit, CapMetro has adjusted the schedule a couple of times to address the problem, but with no success so far. At least they're trying, but in the meantime I go out of my way--to the next nearest bus line 1/2 mile down the road--to avoid taking this route. On the other hand, we used to have an express version of this route that was at least 15 minutes faster, but it was eliminated last summer, despite all my e-mails of protest. I'm still mourning its passing. Anyway, on to the highlights. From my house to downtown, the bus passes two libraries, four schools, four shopping centres (one of which is quite nice; I'll write a whole post on the Mueller shopping centre one of these days) and one cluster of locally owned Mom & Pop-type shops, a handful of bike routes, two hospitals, and UT. One could, in theory, get a lot of places while riding this route, if one were willing to sit for a while. There are faster buses in the neighbourhood, though. So, not my happiest bus post. But I'll balance that out by posting about the bus route near my house that I love, I promise. 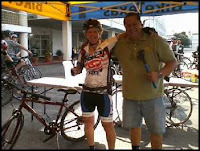 I finally got to go to a BikeTexas event! Yay! 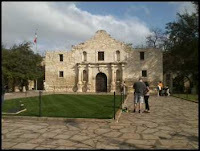 They paid for my ticket, so I took an excused absence from class and had a day in San Antonio last Thursday. I started my day at the Texas Trails and Active Transportation conference in the same way I start a lot of days: I got on a bus. My coworker that I rode with had agreed to meet me downtown at 6:30 AM so we could drive to San Antonio in time for the first session. 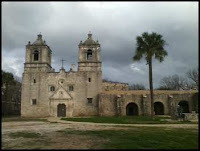 Unfortunately, we hit some massive traffic delays even before we got to the San Antonio city limits, so we arrived about 30 minutes later than expected. Also? That's why I don't drive. I'll take a sweaty bike ride any day over road rage. One of the B-Cycle stations. So we missed the first keynote speaker, which was a real bummer: It was the CEO of Trek Bicycles, John Burke, and by all accounts his presentation was fabulous. But I had no time to be sad before I dashed off to my first chosen breakout session of the day: San Antonio's B-Cycle, the only bikesharing scheme in Texas. They talked about the difficulties involved in permitting and planning-- since bikesharing is still new, city departments are at a bit of a loss when it comes to issuing permits for installing stations. It's their successes, though, that are astonishing. First, they've had one-- and only one-- bike go missing in a year. One! And they got it back! They've also had some issues with tagging, but the bikes are painted with graffiti-resistant paint, so it all came right back off. The only major problem they've had was a tire-slashing incident in which an entire station of bicycles was vandalized overnight and thus were unusable the next morning. I'm amazed at this level of success. Of course, it helps that the two top tourist attractions in Texas-- the Alamo and the Riverwalk-- are in San Antonio, but wow. That's a great start. I hope other cities in Texas take note. Another success: People are buying bikes after using B-cycle. The presenters did downplay this a little bit, pointing to better infrastructure as also helping boost the numbers of cyclists in the city, but they shared a story of a woman who called one day to let them know that she wasn't going to be using her B-cycle card as much. She wanted the main office to know that she loved the program and wasn't walking away from it because she didn't like it, but because she loved it so much she had bought her own bike. There's nothing not to like about that. Additionally, a local bike shop owner spoke up to say that the local bike industry all love B-cycle and don't see them as competition or a threat. Well, no wonder, if B-cycle has turned out to be a gateway to cycling. One other cool thing they shared: The company has a converted bike trailer that they can use to transport bikes between stations. So they move bikes... by bike. It's brilliant. So, it looks like my report of one day of the conference will take a few posts. Maybe it's a good thing I wasn't there all three days. So I didn't mean to leave you all hanging on my Green Living posts-- I've had this one in my head for weeks, but apparently they've been busy weeks. Or something. Usually I realise at about 10 PM on Friday that I forgot, again, to post. getting the bowl clean. Source. This week, I'm not so much going to make a suggestion as share something that I'm having trouble with, in the hopes that perhaps some bright spark out there will have a brilliant idea. My problem? Cleaning the toilet bowl. I can't think of an environmentally-friendly way to do it. For years, I used the traditional blue goo and toilet brush. When my last brush broke, I decided to look into alternatives and have since owned about every handle + disposable cleaning head combination currently on the market (I can rarely find the refills I want when I'm looking. This had become an expensive habit for a while). Right now, I use the Clorox wand, which at least I can eject by picking up the trash can and holding it over the toilet, so I don't drip blue chemicals + toilet water on the floor. However, I'm sure you see the problem here, because it's a single-use product. I'm not wild about that sort of thing. A few weeks back, I was out of refills and the two shops nearest my house (a supermarket and a dollar store) did not have the correct ones. So, I decided to make do and was scrubbing our guest toilet with Comet and a rag for a little while. But I wasn't happy with this solution, either, because 1. I wear disposable gloves when I put my hands into a toilet, so I was still throwing something away, and 2. The rag went into a hot water and bleach solution to disinfect afterwards. That's a small thing, true, but it's still more hot water and more chemicals. Not the solution I was going for. On the chemical front, I know that Seventh Generation makes a toilet bowl cleaner. Perhaps I'll try that next. But that still leaves me with the problem of what to scrub with, and I fear that I am being pushed back into the icky, probably-falling-apart embrace of a regular toilet scrubber. I guess that's better than throwing so much stuff away. 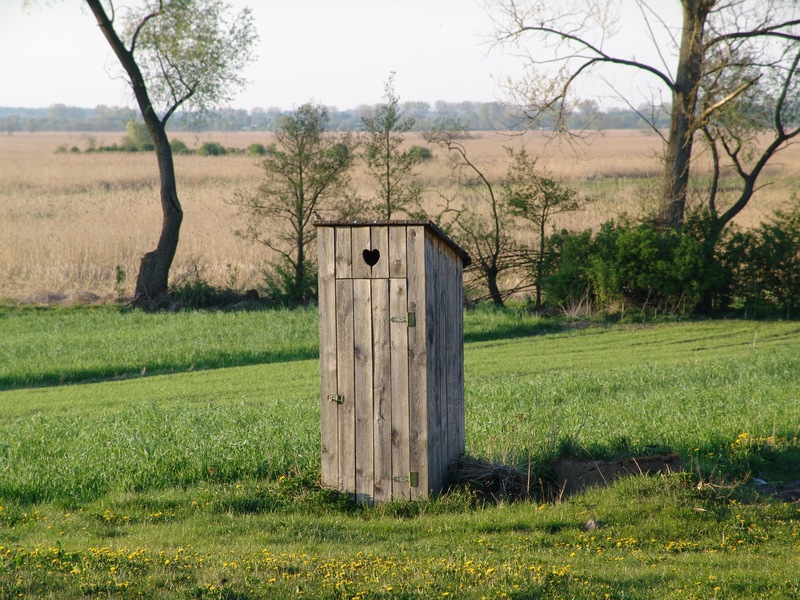 Do you have an environmentally friendly solution to your toilet woes? Or is this outside your realm of worry? Wait. I'm not in Austin. Today, I'm in San Antonio (for the first time ever!) at the Texas Trails and Active Transportation Conference. I'm here as part of my ongoing internship with BikeTexas, and speaking of firsts, this is also the first time I'll be at an event when I'll actually be introduced/acting as a BikeTexas staff member. That's mostly because I don't get to do a lot of events, not because they don't want people to know that I work for them. I can't wait to blog about what I've learned today, but in the meantime, I really hope that I get to see the Alamo before we head back to Austin. I've lived in Texas for 12 years without seeing it, and I have a suspicion that may be illegal. What are you doing today? Did you have to get up at a ridiculous time this morning? 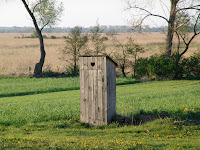 MG over at Chasing Mailboxes has come up with a great cycling challenge called Utilitaire 12. As someone who commutes by cycling, this is a perfect challenge for me... kinda. Some of the categories to fill in (e.g. movie, hair cut) are things I'm unlikely to get to in the next six weeks. Others, like work or the library, are places I practically live, so I'm in luck there. What fun challenges have you joined in this week? The A to Z Blogging Challenge is open to sign up now... are you in? Did you see anything exciting when you looked over there?